I think something is wrong with me. Okay, I know a lot of things are wrong with me but I mean, I think something is wrong with my senses. For some reason I have overlooked the harmony of pumpkin and chocolate until now. 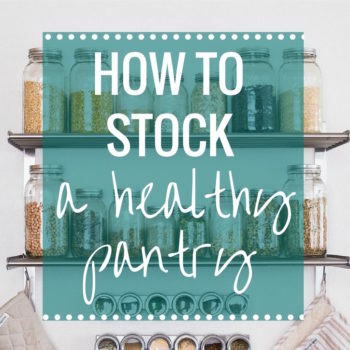 Whenever I would look through recipes or shop at the store, I always passed up anything with that combination. I guess I’ve always thought pumpkin was best paired with things like cinnamon, maple or cream cheese. 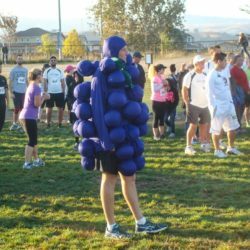 Chocolate just didn’t fit in the pumpkin file of my brain. Well, I don’t know what the heck I was thinking…they’re incredible together! 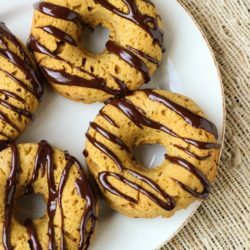 I based this recipe off of my chocolate chip yogurt donuts and used the same flour combination but subbed the yogurt with pumpkin puree instead. There were a few comments on that recipe regarding the challenges of finding quinoa flour so I did a little experimentation and tried replacing it with brown rice flour and then sorghum flour. Both of them were no bueno. So the moral of the story is that quinoa flour is a must here. I know it’s expensive and it can be hard to find, but if you want a recipe that’s gluten-free, nutritious and doesn’t use a bunch of starches and gums, then you have to bite the bullet and gettcha some keeenwwahh flour. Oh, and if you don’t have a donut pan then I highly recommend you invest in one of those too. There are just way too many amazing recipes for baked donuts floating around the internets these days not to have one. I have to admit, as much as I loved these donuts, they’re not the prettiest. They’re a little holey and my chocolate drizzle is all over the place. But you know what? My pie hole thought they were gorgeous. Every last little moist, pumpkin, chocolately crumble. So I’m sharing them anyway. Similar to the chocolate chip donuts, these are dense with a cake-like texture. They can be stored in an airtight container for up to 3 days but they are best when eaten within twenty four hours. Okay, I think this miiiigggghhhtt be it for the pumpkin recipes. I said might. Preheat oven to 350°F then lightly grease a donut pan. Combine dry ingredients (oat flour to pumpkin pie spice) in a medium size bowl and sift together. Combine wet ingredients (from eggs to vanilla extract) in a separate medium size bowl, adding the coconut oil last. Stir half of the 1/3 of the dry mixture into the wet at a time until well combined. Stir just until combined, being careful no to over-mix. Spoon the batter into the donut pan and bake in the oven for approximately 20 minutes. To prepare the icing, melt chocolate with the almond milk for 30 seconds at a time, until it’s melted and thin enough to drizzle on top. Allow donuts to cool for several minutes before icing. Drizzle chocolate on top, serve and enjoy! Leftovers can be stored in an airtight container in the refrigerator for up 3 days. And they look absolutely delicious. Pumpkin and chocolate is one of my favourite combos! Love them together. Pumpkin and chocolate is awesome. I’m glad you gave that marriage a chance. :) Also, the fact that you just wrote pie hole pretty much confirms that you are a favorite blogger of mine. 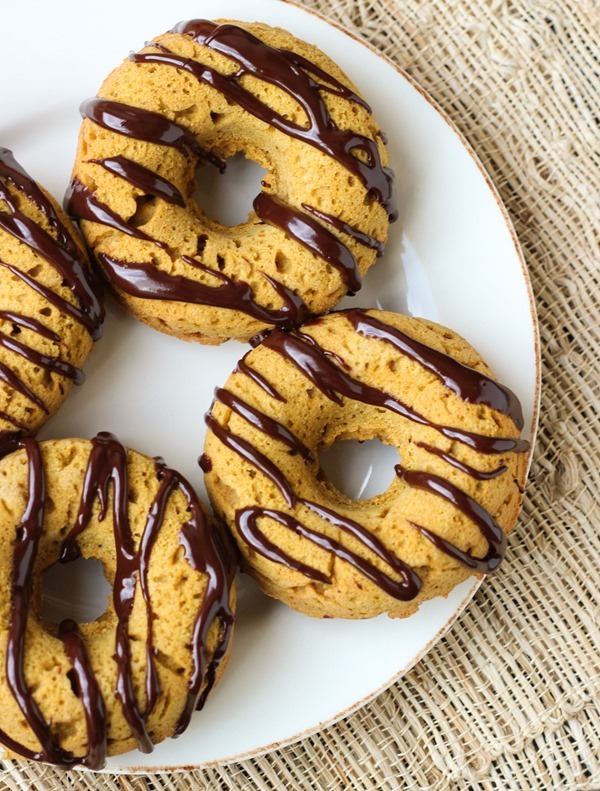 I’ve been on the look out for a good pumpkin donut recipe and I just found it! Yum! 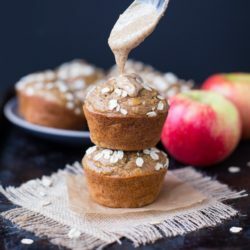 I actually always underestimated chocolate and pumpkin together too, until I made pumpkin chocolate chip muffin tops recently and realized how good the combination is! These donuts look absolutely delicious! I usually can’t make GF recipes I come across because a lot of them call for rice flour or potato starch or tapioca starch, none of which I have. But I actually have all the flours needed for this recipe – woohoo! Ok maybe not THE prettiest, but they still look tasty!! I imagine them to be light and fluffy with the perfect combo of pumpkin and chocolate! Nicely done! Those look heavenly! One of my co workers can’t have gluten, so those would be the perfect donuts to bring in to work! Girl what are you talking about??? These are gorgeous! Also when I’m talking to non-food obsessed friends and I say things like “quinoa flour is a must” and “a donut pan is totally a worthy investment” they look at me like I have 2 heads! Only people like us could ever understand ;) Happy Friday love! I know that I might just be the pickiest eater you’ve ever met. The list is endless of the things I do not care to ever grace my tongue again….BUT, dessert! The key to my heart. Thanks for the yummy recipe! Now, to find a donut pan…. I don’t own a donut pan, so you need to make these for me. Oh Sarah, these donuts are amazing! 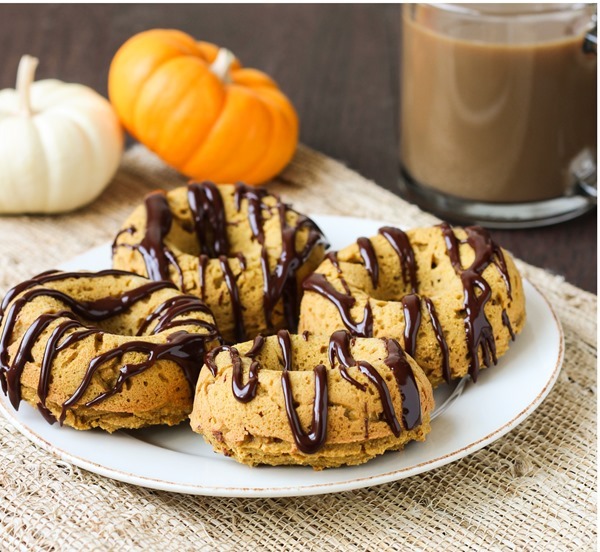 Love the chocolate-pumpkin combo. Ok, I got quinoa flour and I’m almost ready to make these… the donuts pan!!! Gosh, I do need one. I have to admit that I have never tried pumpkin and chocolate together but I believe you when you say it is an amazing combo. I also love you little white pumpkin in the background! So adorable. Happy weekend! 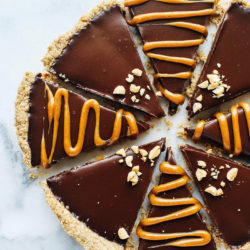 The combination of chocolate and pumpkin was actually one of the first things that got me into eating pumpkin in sweet foods — before that it was more of a savoury thing in my mind. But I know what you mean about certain combinations just seeming to “fit” better… that’s the beauty of trying new things, though! Yum! These looks delicious! I never really thought about putting pumpkin and chocolate together either… hmmm, weird! 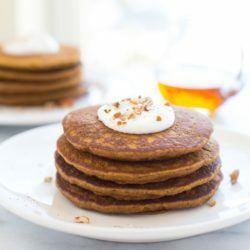 I just saw a recipe for pumpkin chocolate pancakes and was thinking the same thing. Why have I never thought of that combination. Those doughnuts are looking so delicious and perfect for fall! I think chocolate goes good with everything, to be quite honest with you! PS: doesn’t it sound great to hear him called that? You and me both, girl! I just feel bad for all the people who went without work or govt checks as soon as they shut down. Like the families of deployed soldiers. So awful! Do I like pumpkin and chocolate together? Is that even a valid question?!? OF COURSE I like the two together ;) And in donut form??! Oh heck yes! I think I also kinda overlook the chocolate / pumpkin pairing too! These donuts look awesome – I love that drizzle! Yum! Love pumpkin and chocolate together. How many donuts does the recipe make? WHY must you torture me with this??? I have an apple cake in the oven and all I want to do is eat it but it’s for my neighbors. So reading this while smelling that is just too much to handle right now! 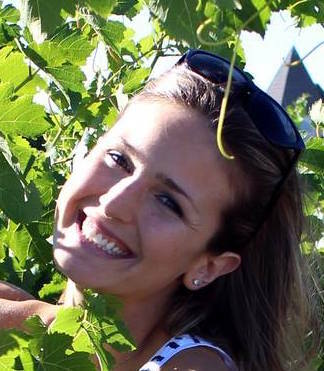 I’m new to this blogging world, but after a week and a half I’m loving what it has to offer! 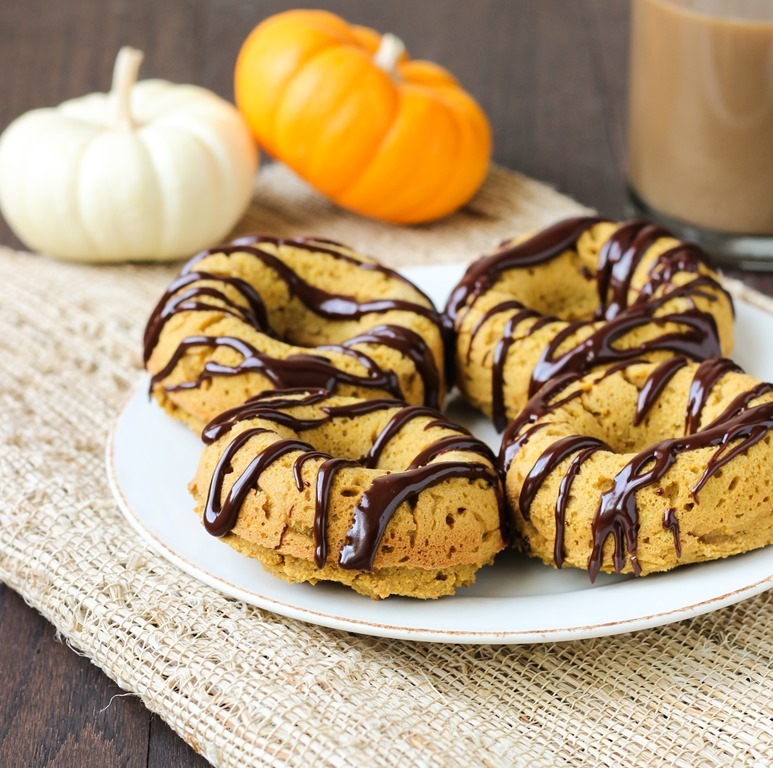 Love the recipe, I still have some left over pumpkin puree from my last recipe…this may be the perfect excuse to make these donuts! Thanks! I love pumpkin & chocolate together! 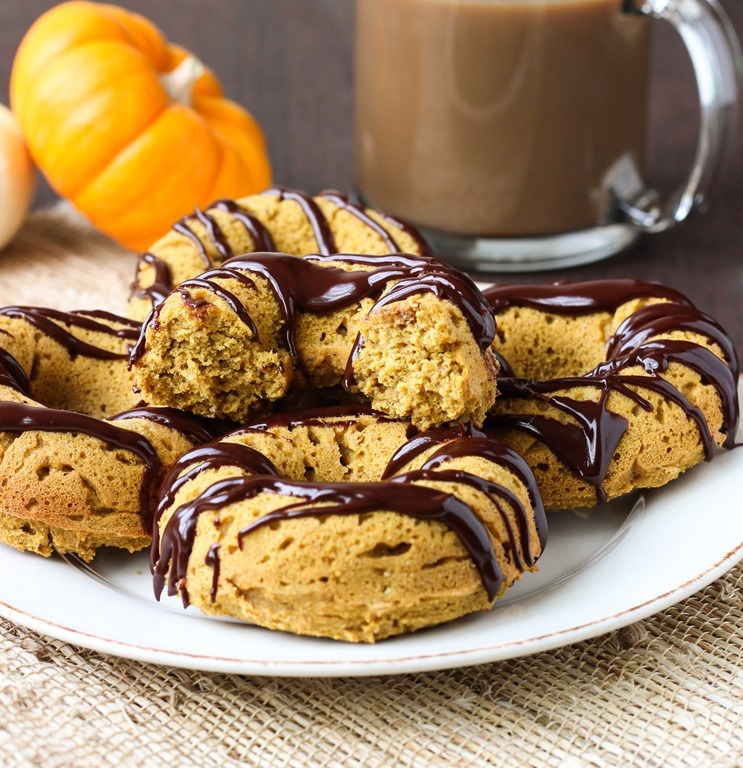 I make chocolate pumpkin cookies that are so yum. And you’re right, I definitely need to get a donut pan ASAP!! Oh my gosh…. I can’t… I can’t.. These freaking donuts!!! That chocolate icing. I am in love. LOVE this! Ok, so you’ve convinced me to get a donut pan/tray/whatever it’s called because you’ve got some amazing looking donut recipes! I always thought chocolate and pumpkin sounded weird until I tried it and really loved it! Oh my goodness, I want to LICK that gooey, melty chocolate RIGHT NOW. I’m PMS’ing and foodgasming all over your blog right now. Sorry about that… TMI. We need to live closer because my baking skills are no where near yours. 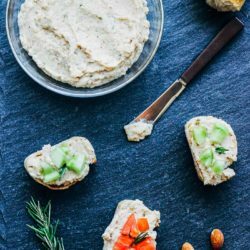 How do you keep making yummy foods that look so good? Skills, sister. That’s why that man proposed :). Plus you’re beautiful! I absolutely love pumpkin and chocolate! It’s a seriously underrated combination- and you can never have too many pumpkin recipes! I NEED a donut pan. Seriously. These are amazing. And baked donuts? These are going on my pinterest ASAP! I haven’t had a chance to read all the comments yet ~ but what would happen if I swapped say stevia or lucuma for the brown sugar? I’m not sure about the flours ~ but I have to be low/no sugar (as wel as low carb) for health reasons, and I love pumpkin things. Thoughts? I’ve never cooked with stevia so it’s hard for me to say how it would work out. Coconut sugar might be a good substitution. How about sub’ ing all the flours for almond flour? I’m not sure how that would turn out but let us know if you give a try!